Dr. Myran received her Doctor of Pharmacy degree from the University of Wyoming in 2012. She completed a PGY-1 Pharmacy Practice Residency in 2013 at the Billings Clinic Hospital in Billings, Montana. 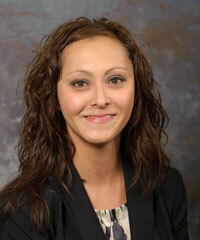 Dr. Myran’s practice site is at Cheyenne Regional Medical Center working with the UW Family Medicine Residency Program. She teaches in the Therapeutics courses and her clinical and research interests include infectious diseases, critical care, family medicine, and care transitions.